70 Anger is never justified. Attack has no foundation. It is here escape from fear begins and will be made complete. Here is the real world given in exchange for dreams of terror. For it is on this forgiveness rests and is but natural. You are not asked to offer pardon where attack is due and would be justified. For this would mean that you forgive a sin by overlooking what is really there. This is not pardon. For it would assume that, by responding in a way which is not justified, your pardon will become the answer to attack that has been made. And thus is pardon inappropriate, by being granted where it is not due. 71 Pardon is always justified. It has a sure foundation. You do not forgive the unforgivable nor overlook a real attack that calls for punishment. Salvation does not lie in being asked to make unnatural responses which are inappropriate to what is real. Instead, it merely asks that you respond appropriately to what is not real by not perceiving what has not occurred. If pardon were unjustified, you would be asked to sacrifice your rights when you return forgiveness for attack. But you are merely asked to see forgiveness as the natural reaction to distress which rests on error and thus calls for help. Forgiveness is the only sane response. It keeps your rights from being sacrificed. 72 This understanding is the only change that lets the real world rise to take the place of dreams of terror. Fear cannot arise unless attack is justified, and if it had a real foundation, pardon would have none. The real world is achieved when you perceive the basis of forgiveness is quite real and fully justified. While you regard it as a gift unwarranted, it must uphold the guilt you would "forgive." Unjustified forgiveness is attack. And this is all the world can ever give. It pardons "sinners" sometimes but remains aware that they have sinned. And so they do not merit the forgiveness that it gives. 73 This is the false forgiveness which the world employs to keep the sense of sin alive. And recognizing God is just, it seems impossible His pardon could be real. Thus is the fear of God the sure result of seeing pardon as unmerited. No one who sees himself as guilty can avoid the fear of God. But he is saved from this dilemma if he can forgive. The mind must think of its Creator as it looks upon itself. If you can see your brother merits pardon, you have learned forgiveness is your right as much as his. Nor will you think that God intends for you a fearful judgment which your brother does not merit. For it is the truth that you can merit neither more nor less than he. 74 Forgiveness recognized as merited will heal. It gives the miracle its strength to overlook illusions. This is how you learn that you must be forgiven too. There can be no appearance that can not be overlooked. For if there were, it would be necessary first there be some sin which stands beyond forgiveness. There would be an error that is more than a mistake—a special form of error which remains unchangeable, eternal, and beyond correction or escape. There would be one mistake which had the power to undo creation and to make a world which could replace it and destroy the Will of God. Only if this were possible could there be some appearances which could withstand the miracle and not be healed by it. 75 There is no surer proof idolatry is what you wish than a belief there are some forms of sickness and of joylessness forgiveness cannot heal. This means that you prefer to keep some idols and are not prepared as yet to let all idols go. And thus you think that some appearances are real and not appearances at all. Be not deceived about the meaning of a fixed belief that some appearances are harder to look past than others are. It always means you think forgiveness must be limited. And you have set a goal of partial pardon and a limited escape from guilt for you . What can this be except a false forgiveness of yourself and everyone who seems apart from you? 76 It must be true the miracle can heal all forms of sickness, or it cannot heal. Its purpose cannot be to judge which forms are real and which appearances are true. If one appearance must remain apart from healing, one illusion must be part of truth. And you could not escape all guilt, but only some of it. You must forgive God's Son entirely. Or you will keep an image of yourself that is not whole and will remain afraid to look within and find escape from every idol there. Salvation rests on faith there cannot be some forms of guilt which you cannot forgive. And so there cannot be appearances which have replaced the truth about God's Son. 77 Look on your brother with the willingness to see him as he is. And do not keep a part of him outside your willingness that he be healed. To heal is to make whole. And what is whole can have no missing parts that have been kept outside. Forgiveness rests on recognizing this and being glad there cannot be some forms of sickness which the miracle must lack the power to heal. 79 I thank you, Father, for your perfect Son, and in his glory will I see my own. 80 Here is the joyful statement that there are no forms of evil which can overcome the Will of God—the glad acknowledgment that guilt has not succeeded by your wish to make illusions real. And what is this except a simple statement of the truth? 81 Look on your brother with this hope in you, and you will understand he could not make an error that could change the truth in him. It is not difficult to overlook mistakes that have been given no effects. But what you see as having power to make an idol of the Son of God you will not pardon. For he has become to you a graven image and a sign of death. Is this your savior? Is his Father wrong about His Son? Or have you been deceived in him who has been given you to heal, for your salvation and deliverance? 1 The Son of God is limitless. There are no limits on his strength, his peace, his joy, or any attributes his Father gave in his creation. What he wills with his Creator and Redeemer must be done. His holy will can never be denied because his Father shines upon his mind and lays before it all the strength and love in earth and Heaven. I am he to whom all this is given. I am he in whom the power of my Father's Will abides. 2 Your Will can do all things in me and then extend to all the world as well through me. There is no limit on Your Will. And so all power has been given to Your Son. In the Bible, Matthew 28:18, Jesus speaks the words, "All power is given unto me," which he spoke shortly after his resurrection. These words are now being spoken by us. Just as Jesus is proclaimed as the Son of God, we are as well. There is no separation from each other or from our elder brother Jesus. In the Clarification of Terms, we read, "The name of Jesus is the name of one who was a man but saw the face of Christ in all his brothers and remembered God." (Clarification of Terms.5.2.1) He walked this path we walk and went all the way home. Our task is to learn to ignore the voice of the ego, so we can listen only to the Voice for God (the Holy Spirit). Freedom from the ego is indeed the reality of the mind of the mystic who, while still in this dream, is nevertheless in true perception. To be in true perception is to be in the real world. We come to the real world when we see the face of Christ in all our brothers with no exceptions. We, together with Jesus, are all equal as the Sons of God, although Jesus explains that he is further in time. This makes sense to us since we still believe in time, but in truth, there is no time. There is only now . Time is of our own making. Jesus, as a symbol of the truth within us, is outside of the dream, guiding us, step by step, up the ladder we seemed to have descended. "There is no need for help to enter Heaven for you have never left." (C.5.1.1) Yet we do believe we have left Heaven and thus we need his help to awaken to what we really are. We need this help as it comes from outside of the thought system of the ego. With the ego, we are in a never-ending loop. Our true reality is limitless and eternal. We have all the characteristics of God, but we can only know this through experience. When we identify with the ego and think the body and personality define us, we are in the confines of time and space. "But there is need for help beyond yourself as you are circumscribed by false beliefs of your Identity, which God alone established in reality." (C.5.1.2) Jesus is a familiar symbol in our minds. He is eager to help us and always available to us when we turn to him. He assures us that the truth about us, as the Son of God, is that we are limitless. We can't limit our strength, our peace, our joy, nor any other of the attributes that are natural to us because they have been given to us by God in our creation, and His Will must be done. Again and again, we are told that we are limitless and have not changed ourselves. In fact, we can't change ourselves. We can simply lose ourselves, temporarily, in this illusion and forget what we are. We believe that we have messed up, we have experienced pain and grief, and we feel that we have been abandoned by God. We feel unworthy of His Love, but they are just thoughts we give power to and are not the truth. We have come to believe in our thoughts so thoroughly that we actually think we are these characters in the dream. Jesus reminds us, it is our dream and we are dreaming it. We are not the dream figures. We fear love because the ego has convinced us that we have done something terrible. It has constructed a myth that we have killed God to achieve our separate identity, we deserve to suffer, and we need to continue to stay away from God’s love or we will be annihilated. None of this is true. It just keeps us small, limited, and confined to our tiny kingdoms, circumscribed by our bodies and our world. Yet the truth of the Son is that "His holy will can never be denied, because his Father shines upon his mind, and lays before it all the strength and love in earth and Heaven." (W.320.1.4) What He wills must be done. We are told again that nothing we have done, or still can do, will ever change the truth about us. We just have to wake up to the truth, and we do so by bringing all our false beliefs and perceptions to the altar of truth within. We reclaim our innocence and our unlimited will when we forgive all our misperceptions with the help of the Holy Spirit. "The Holy Spirit wants only this, for sharing the Father's Love for His Son, He seeks to remove all guilt from his mind that he may remember his Father in peace." (T.13.I.1.2) (ACIM OE T.11.X.89) Our way home comes from undoing the false beliefs we hold and releasing our sense of specialness, judgments, and grievances which block God’s love from our awareness. By surrendering our values, beliefs, and concepts, we recognize that they have never served us. Our way has never made us happy. The conditioned mind has been deceived. We have bought into the cult of the ego and are marching onto death. By now, we have been well versed in the process of forgiveness. It requires that we start to look at our own minds and take responsibility for our projections. Our nature is love, and therefore, being unloving brings us pain. We are called to admit that we are wrong when we think we can gain something through attack, judgment, comparison, and trying to win at someone else’s expense. The pleasure of putting someone down and seeing ourselves as superior always brings more pain and more guilt. We have betrayed our true loving nature and this has hurt us. We think that by seeing guilt in them, we will feel more innocent, but we are wrong. All that happens is that we feel more pain. A high level of self-honesty and personal responsibility is called for. "How do I try to get away with something?" "How do I try to protect and defend myself?" "How do I do my best to look after my own interests?" "What do I get impatient and indignant with others about?" 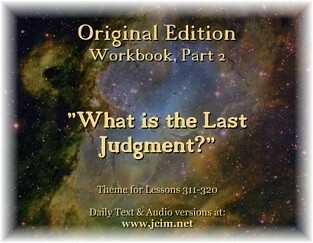 "What do I think I can gain with my opinions and my judgments?" "How do I try to manipulate others to do my will?" "How do I try to gain at their expense?" I have had people say that they have totally forgiven someone in their lives, but the standard for true forgiveness is extremely high. Jesus says, if we have totally forgiven someone, then we would see a vision of loveliness "reflected in a form so holy and so beautiful that you could scarce refrain from kneeling at his feet." (W.161.9.3) Forgiving anyone perfectly and completely means Jesus would generalize this experience to everyone, and our work here would be over because we would know everyone as the Christ. It does not matter what misbehavior a brother is engaged in. When we make a judgment about it, we can be assured that we have first judged ourselves for some version of the very same thing. They are a mirror of our own inner self-judgment reflected back at us. They are there to help us see our own shadow. It is the self-concept that we value in ourselves, but all self-concepts are false, whether we see them as positive or negative. Anything we describe as our personalities is not the truth. When we take responsibility for our judgments and are prepared to look at our own version of what we are judging, the healing can begin. In our self-acceptance, we will find acceptance of others. Pay attention to what is going on inside of you. When we justify our thoughts and feelings by the stories we tell, we see ourselves as the victims of what others do. "In dreams effect and cause are interchanged, for here the maker of the dream believes that what he made is happening to him. He does not realize he picked a thread from here, a scrap from there, and wove a picture out of nothing. For the parts do not belong together, and the whole contributes nothing to the parts to give them meaning." (T.24.V.2.2-4) (ACIM OE T.24.VI.41) By watching our thoughts and being willing to release them to the Holy Spirit, we see that no one is responsible for how we feel except ourselves. There is no one outside of us. We are all One Self. When we release all the comparisons we make, all the judgments, all the feelings of jealousy, and all the attack thoughts and truly surrender our will, love comes pouring in. We must take responsibility for everything. We are not victims of anyone or of any circumstance. Forgiveness is not about forgiving anything real, but only our interpretation of an event, person, or situation. The truth is that we are all innocent. We share the same nature as Jesus. Why does this seem so difficult? We need to understand how invested we are in our individuality. This self that we have made is very threatened by the truth. Recognize this and be gentle with yourself, but don't delay your homecoming. Salvation is not in the future. It is available to us now. In every moment, we can release what is keeping us from the love we are. Choose love now. As long as we rationalize our anger or defend our perceptions, we will not know of our changeless nature and of our unlimited power. Because we want so much to be right about the way we see things, we have agreed to forsake our own happiness—as crazy as that is! Today, ask yourself, "What limitations am I putting on myself?" A limitation is to believe in the reality of the body. We think we are these separate individuals, fighting for our survival in the world and competing with every other body. We feel vulnerable. We fear death. We may be feeling anger, pain, distress, sadness, disappointment, anticipation, stress, grief, or even pleasure, but these all come from our incorrect perceptions, reminding us of what is false and limiting. Let us today bring all these thoughts to the Holy Spirit and be willing to have Him undo them so we can know the truth about the Self. What we are called to do is bring these thoughts to the light of Truth, which is already in us. Through this process, we increasingly recognize that all God's power is given unto us because we are God's Son. This is not a statement of arrogance because it is not a power that is ours alone. We can only know this power when we realize that we all share the same power and the same Self. This Self is invulnerable. It is eternal. It can never die.